At the beginning of July 2014 I visited one of my favourite places in the world, the Adler Planetarium in Chicago. Like the Griffith Observatory in Los Angeles that I had visited two days earlier, it is spectacularly located though not on hills but on a small peninsula jutting into Lake Michigan with a wonderful view of the Chicago skyline. Again like Griffith Observatory, it has been extended relatively recently. 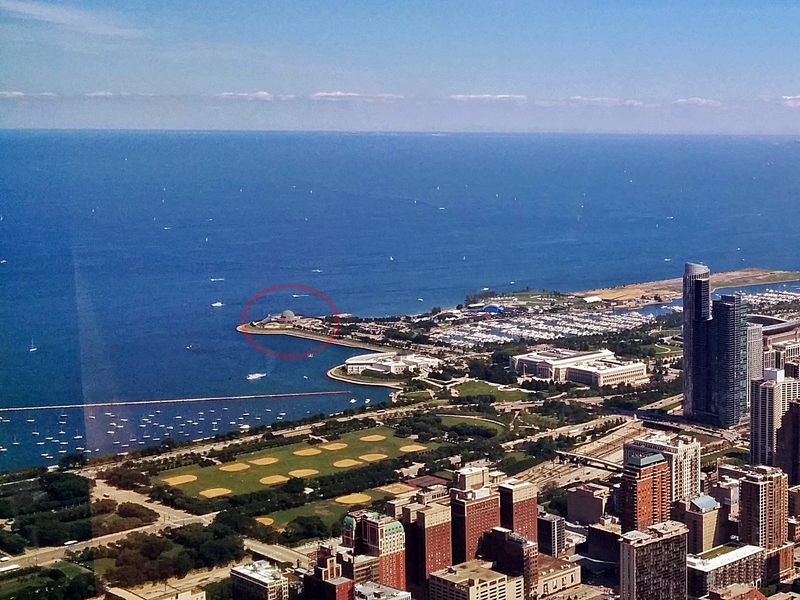 Instead of digging underneath the original heritage building the Adler Planetarium was extended with a glass Sky Pavilion that opened in 1999 and provided extra space with great views for exhibitions and a cafeteria. There have been more recent developments as well. Soon after my last visit in 2011 the new Grainger Sky Theatre opened; this 300-seat sky theatre is believed to be the most sophisticated in the world. Its 20 projectors are controlled by two supercomputers, 46 servers and 42 Nvidia Quadro GPUs (graphic processor units) and provide a screen image of 8000 by 8000 pixels or 64 megapixels. This image, which is refreshed 30 times a second, is sharper than the resolution of the human eye. To experience the Grainger Sky Theatre I booked our little group into seeing the Adler’s premier show, Destination Solar System. It was not cheap, as to see it is necessary to purchase Anytime All Access passes at $34.95 adults and $29.95 for children. Still it is worth the cost for the 30-minute show plus the pass allows viewing all other shows at the planetarium together with all the exhibits. To my pleasant surprise the show was very much designed with young children in mind and perfectly suited the three 8 to 11 year olds in our group. The fun began in the entrance foyer as we waited to be allowed into theatre. We were told that it is the year 2096 and we were about to undertake a tour of the highlights of our solar system. Inside, after the theatre filled the show began with the blast off into space. There was a live guide Jesse who wandered among the audience telling us about what we were seeing, all the while bantering with both members of the audience and the spaceship’s computer Max. The images were truly impressive with sights ranging from the surface of the Moon to activity on the Sun’s visible surface together with visits to Titan, Mars and the asteroid belt. Certainly all the highlights in the solar system were visited. At one stage there was a serious problem with our spaceship and Jesse heroically had to make an emergency repair (I do not want to give too much away). No surprise that the three children in our group loved the show. I wondered about Jesse as he seemed far too good an actor to be a usual planetarium presenter. A little subsequent research told me that there are six Jesses, or possibly three Jesses and three Jessies as three are male and three female. They are all actors with experience in improvisation and were given some astronomical training by the Adler staff. 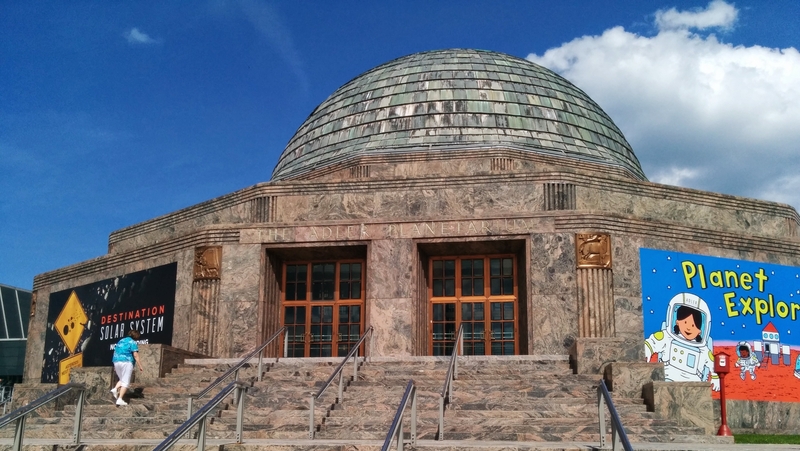 We did see another of a number of shows on offer at the Adler Planetarium, but Destination Solar System is highly recommended, especially for those with children in tow. Presented in a state-of-the-art sky theatre, the show is fun and in a refreshingly new style. This entry was posted in Uncategorized and tagged Adler Planetarium, Chicago skyline, Solar System. Bookmark the permalink. I gave a public lecture at the Adler called ‘Looking up from Down Under ‘. Huge audience – and they paid me 🙂 however I couldn’t find a bank outside Chicago which would cash the cheque.